Figure F8. 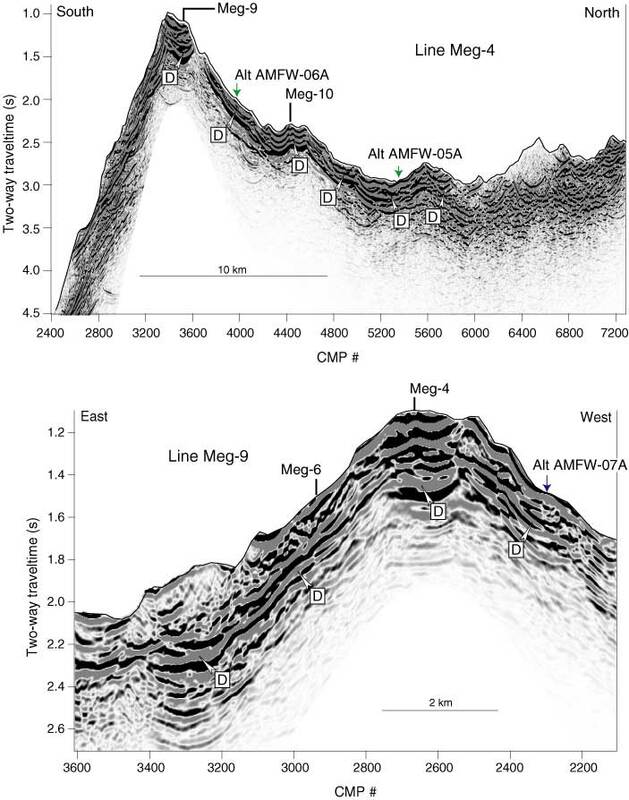 A. Time-migrated MCS Line Meg-4 modified from Canales et al. (2004) showing structure along alternate site ridge-parallel transect (proposed Sites Alt AMFW-05A and 06A). One or two single-bit penetrations might be attempted (depending on time available, previously addressed scientific objectives, and suitable outcrop) between common midpoints (CMPs) 3900 and 5400. Reflector D is interpreted to coincide with top of unaltered peridotite. B. Time-migrated MCS Line Meg-9 modified from Canales et al. (2004) showing structure across the dome and the approximate location (between CMPs 2200 and 2400) of an alternate site on the southeast shoulder of the dome (proposed Site Alt AMFW-07A). Reflector D is interpreted to coincide with top of unaltered peridotite.